Remember, O most loving Virgin Mary, that it is a thing unheard of that anyone ever had recourse to your protection, implored your help or sought your intercession, and was left forsaken. Filled therefore with confidence in your goodness I fly to you, O Mother, Virgin of virgins. To you I come, before you I stand, a sorrowful sinner. Despised not my poor words, O Mother of the Word of God, but graciously hear and grant my prayer. 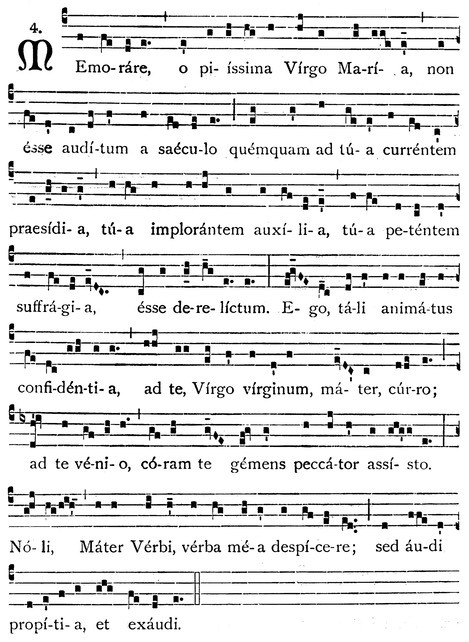 Note: The above music is from the Cantus Selecti (Abbaye Saint-Pierre de Solesmes, 1949, page 173) which is in public domain and may purchased at solesmes.com .